This latest study follows up on Howarth and colleagues’ controversial April 2011 paper that provided the first comprehensive analysis of greenhouse gas emissions from shale gas obtained by hydraulic fracturing. That study found that when gas wells are “fracked”, they leak large amounts of methane and pose a significant threat to the global climate. “We stand by the conclusion of our 2011 research,” said Howarth. That research undercuts the logic of energy sector claims that shale gas is a “bridge” to a low-carbon energy future. Those claims are based on the fact that natural gas (which is mainly methane) has half the carbon content of coal, and when burned for electricity it is more energy efficient than coal. This independent journalism depends on public support. Click here learn more. However, those climate gains are more than negated by methane leaks both at the well during the fracking process (called flow-back), and through the gas delivery and distribution system. Howarth and colleagues estimate that between 3.6 and 7.9 percent of all shale gas produced leaks – called “fugitive emissions” – into the atmosphere, making it worse than burning coal or oil. Please throw something in the tip jar before reading on. Methane has 105 times the warming potential of CO2 over a 20-year time frame, after which it rapidly loses its warming potential. If large amounts of methane are released through fracking – as seems likely with hundreds of thousands of new wells forecast in the next two decades – Howarth says global temperatures could rocket upward from 0.8C currently to 1.8C in 15 to 35 years, running the risk of triggering a tipping point that could lead to catastrophic climate change. “Our primary concern is that methane emissions over the coming two decades will drive the entire climate system past a major tipping point,” he told IPS. A study by the U.S. National Center for Atmospheric Research (NCAR) last September also concluded that methane leaks meant that natural gas provided little advantage over using coal. Even if leaks are one to two percent, far less than the Howarth estimates, it would only be slightly better than continuing to burn coal, the “Coal to gas: the influence of methane leakage” study concluded. Fracking involves drilling vertically 500 to 3,000 metres into gas- bearing shale rock and then horizontally for 1,000 metres or more along the shale formation. Then chemicals and large amounts of water are pumped underground at high enough pressure to fracture the shale, releasing the gas into the pipeline. 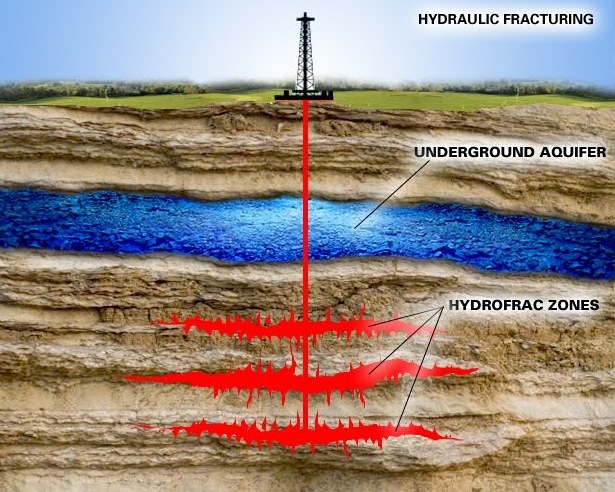 The first uses of hydraulic fracturing were in Texas in the early 1990s, but were very limited. However, new technologies developed in the last eight years have made it possible to get at deep, widely dispersed deposits of gas. The George W. Bush administration’s 2005 Energy Policy Act exempted fracking from regulations under the U.S. Clean Water Act, clearing the way for the shale gas gold rush. In recent years, shale gas production has grown 48 percent per year, according to the U.S. Energy Information Administration. There are now an estimated 400,000 wells in the continental U.S. and tens of thousands more planned in the next year or two. Public concern has risen over water and air pollution, water shortages, disruption of rural neighbourhoods, and even earthquakes. Ohio halted fracking this month in one part of the state after a series of small earthquakes were linked to injecting fracking wastes underground. Fracking a well requires injecting 10 to 15 million litres of water and 200,000 litres of chemicals and the resulting wastewater is often too contaminated to be reused and is pumped deeper underground or left in wastewater ponds. Although the gas industry long denied that fracking contaminates drinking water wells and aquifers, hundreds of claims have been made over the years. However, very little independent research has been done. Last year, researchers at Duke University looked at 68 fracking sites and found groundwater with methane concentrations 17 times higher than in wells located where fracking was not taking place. Some of the levels were higher than “immediate action” hazard levels. Last year, the U.S. Environmental Protection Agency (EPA) finally began to conduct its first in-depth study of the risks to drinking water. Preliminary results released late last year revealed drinking water contaminated by benzene, a known carcinogen and one of the chemicals used in fracking. From a climate perspective, shale gas is certainly worse than conventional gas, said Zeke Hausfather, an energy expert at Efficiency 2.0 in New York, which works with power utilities. However, Hausfather disputes Howarth’s findings that shale is worse than coal since the latter emits more CO2 and while methane has a life of only 10 years in the atmosphere, CO2 stays for thousands of years. “There is a lot of uncertainty about methane leakage and much of it is based on estimates,” Hausfather told IPS. Howarth’s range is on the high side, with his upper estimate of 7.9 percent, 400 percent higher than estimates for conventional gas leakage, he said. However, reducing methane leakage from shale gas is an important issue that regulators should address. In the face of strong industry resistance, the EPA has proposed regulations to require capture of methane at the time of well completion. Regulations are necessary since economic considerations alone have not driven such reductions, said Anthony Ingraffea of Cornell University and one of Howarth’s co-authors. However, plugging the methane leaks downstream from the wellhead in transmission pipelines, compressor stations, and decades-old distribution pipelines under the streets of cities and towns throughout the U.S. and Canada would be extraordinarily expensive, Ingraffea said. “Would the capital be better spent on constructing a smart electric grid and other technologies that move towards a truly green energy future?” he asked. First published as Shale Gas a Bridge to More Global Warming – IPS ipsnews.net.